The Federal Way City Council awarded painter Maura McGurk the People’s Choice Award at their council meeting Tuesday night, in recognition of her mixed media painting, Mia, Siena, Stripes. The work is part of the Arts Alive exhibition currently on view at City Hall. 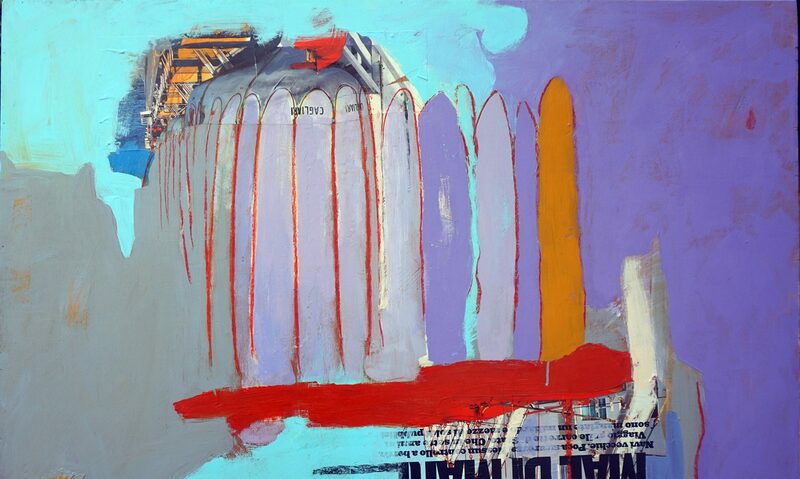 McGurk said that her inspiration for the painting came from two sources. One was an observation made at her last opening, by a friend’s husband who claimed to know nothing about art. “He said that he noticed that I used alot of patterns, but painted over them with layers of solid paint. Then he apologized for asking such a dumb question, but wanted to know what it meant to me to hide all those patterns underneath. Dumb question?! I was embarrassed to tell him that I hadn’t even noticed that in my own process!”. McGurk laughs at the memory. She says she took this as a personal challenge to work more directly and consciously with pattern. 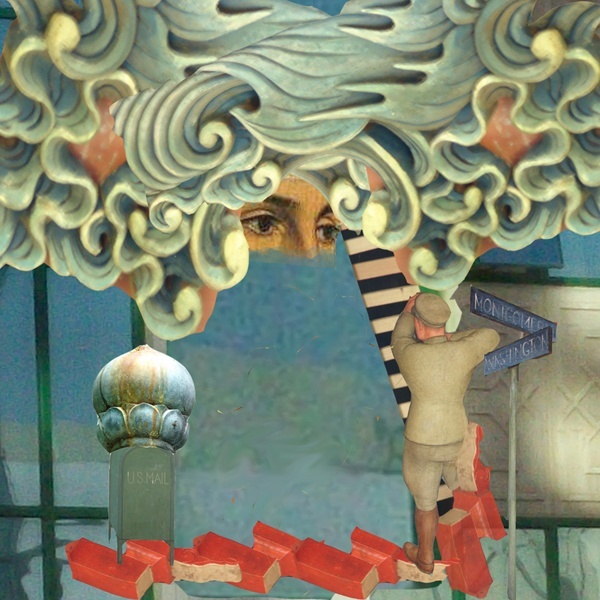 This, in turn, led to a new awareness of repeating shapes and motifs in the world around her. During a trip to Siena, Italy this summer, her eye was drawn especially to stripes. She says that stripes were evident all around her: single bricks placed side-by-side lining an archway, rows of bricks angled in opposing directions that created giant stripes across the main piazza, the bold black and white horizontal marble of Siena’s Cathedral, the stripes in the flags around town, and even the black and white stripes in her wife’s skirt, which echoed those of the Cathedral. Drawing a little bit from each of these scenarios, McGurk consciously constructed a patterned work based on Siena’s stripes. “It’s a little more painstaking than I usually work, and it was tempting to sweep across the whole thing with a big brush loaded up with paint. But I made a deal with myself, and a deal is a deal”. The Arts Alive exhibition will be on view at City Hall through January 6, 2016. One of the most stunning places I’ve been to is Arles, in the south of France, specifically retracing some of Van Gogh’s steps. This is where Vincent van Gogh spent about a year – probably the most eventful year of his life. Arles is where he created many of his masterpieces (the painting of his bedroom, Cafe Terrace at Night, Night Cafe, his yellow sunflowers, and many more). It’s also where he was – briefly – roommates with Paul Gauguin, and where he cut off his ear. It was an artistic high point, and also the beginning of the end. 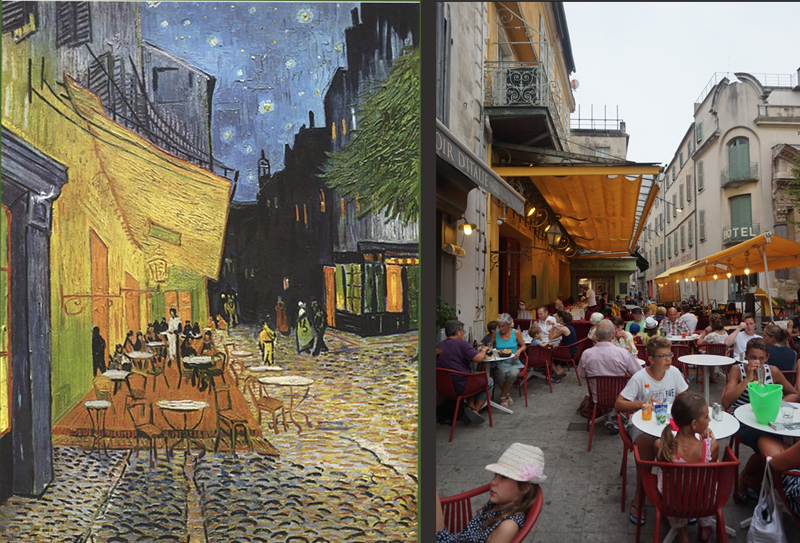 In Arles, the cafe where Vincent spent many evenings and immortalized in oil paint still stands. The yellow awning is still there, even the green of the neighboring shop down the way, and the blue-gray door jamb of the neighbor on the other side. It’s amazing to be able to see this little piece of history, practically unchanged after over 130 years, and to even walk into the painting, so to speak. This left a huge impression on me, and made my eyes a little misty. When I came home, I put a reproduction of the Cafe Terrace at Night on my studio wall, to remind me about being hard-working, and sensitive, and how great things can happen from everyday moments. Good news! Pimienta Bistro & Bar, the best restaurant in the South Sound (IMHO) is showing some of my Italy-inspired artwork to kick off the summer. You’ll see three brand-new works, as well as others created during, and inspired by, my last visit to Italy. The Mediterranean palette of my paintings perfectly complements the orange walls, and the textured surfaces reflect the rustic, aged wood that decorates the walls and bar. Stop by and try a Basil Martini, Crispy Chickpeas or other European/Latin American fusion dish. 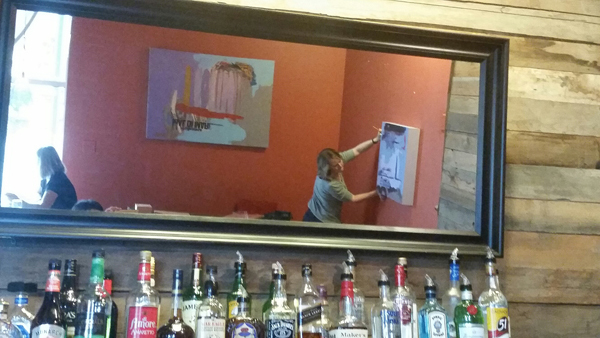 Seen from the mirror above Pimienta’s bar, the artist hangs the show. I’m very pleased to have been invited by Chef Blanca Rodriguez to show about 15 of my paintings at Pimienta Bistro & Bar in Federal Way, Washington. Open House style; drop in anytime! A little party to celebrate my Italy-spired paintings as they hang on Pimienta’s gorgeous orange walls. Our first bottle of wine and round of appetizers are complimentary; after that, special Happy Hour pricing will apply. It’s a hidden gem, behind a car wash. You’ll be amazed at the rustic decor and delicious fusion food that live within! The show will be up through June, so if you can’t make the opening reception, please come by another time. Tell them Maura sent you, and order the Crispy Chickpeas, along with a Basil Martini; you won’t be sorry! I’m very happy to announce that one of my digital collages, Treehouse, has been published by the Lavender Review. 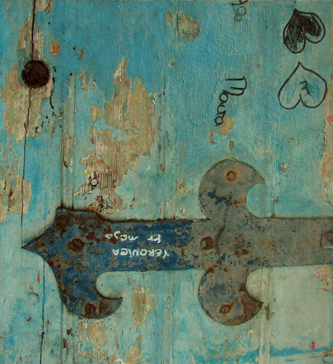 This journal publishes lesbian poetry several times each year. You can check out the issue here. Happy Celtic Spring! (Also known as Imbolc or St. Brigid’s Feast Day). Today we’re halfway between the winter and spring equinoxes, and this was traditionally a pagan feast day to celebrate the lengthening of the days. That increasing daylight means a lot to me on a physical level, as well as a metaphorical one. It feels good to see the sun shining more, and to feel as though we’re all crawling out of hibernation. Catholicism, of course, co-opted the day and it became St. Brigid’s Feast Day. I can’t object too much, since she seems pretty great. A patron saint of Ireland, she also founded an art school and was quite possibly a lesbian. St. Brigid’s crosses are still made in Ireland to celebrate the day, and are hung above doorways or windows to protect the house and its inhabitants. This time of year is so full of promise. Here’s to longer days and new beginnings!